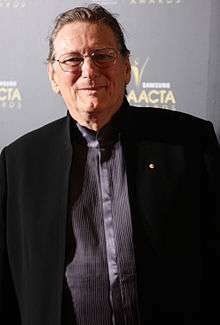 Frederic Alan "Fred" Schepisi, AO (SKEP-see; born 26 December 1939) is an Australian film director, producer and screenwriter. His credits include The Chant of Jimmie Blacksmith, Plenty, Roxanne, Six Degrees of Separation, Mr. Baseball and Last Orders. Frederic Alan Schepisi was born in Melbourne, Victoria, the son of Loretto Ellen (née Hare) and Frederic Thomas Schepisi, who was a fruit dealer and car salesman of Italian descent. He began his career in advertising and directed both commercials and documentaries before making his first feature film, The Devil's Playground, in 1976. In 1991 his film The Russia House was nominated for the Golden Bear at the 41st Berlin International Film Festival. In 2005 Schepisi directed and co-produced the HBO miniseries Empire Falls, for which he was nominated for the Emmy Award for Outstanding Directing for a Miniseries, Movie or Dramatic Special and the Directors Guild of America Award for Best Director of a TV Film. In 2007 he was the Chairman of the Jury at the 29th Moscow International Film Festival. In April 2008 it was announced Film Finance Corporation Australia was providing funding for Schepisi's film The Last Man, about the final days of the Vietnam War. It was scheduled to begin filming in Queensland, with Guy Pearce and David Wenham in leading roles, towards the end of the year. In 2011 Schepisi directed The Eye of the Storm. Filmed in Melbourne, Sydney and Far North Queensland, and based on the novel by Patrick White, The Eye of the Storm stars Charlotte Rampling, Judy Davis and Geoffrey Rush. The story is about "children finally understanding themselves through the context of family". In 2012 he directed Words and Pictures starring Juliet Binoche and Clive Owen. Schepisi has also directed a number of music videos, including for the 2008 song "Breathe" by Kaz James featuring Stu Stone. Fred Schepisi has been married three times and has seven children. Joan gave him four children; his second wife Rhonda died of cancer, after giving him two more children. His third wife, Mary, whom he married in 1984 and with whom he had a seventh child, is an American. 1 2 3 "Fred Schepisi Biography (1939– )". FilmReference.com. Retrieved 16 September 2011. 1 2 "A Cry in the Dark (1988) - Release dates". IMDb.com. Retrieved 14 June 2012. ↑ "Berlinale: 1991 Programme". berlinale.de. Retrieved 26 March 2011. ↑ "29th Moscow International Film Festival (2007)". MIFF. Retrieved 22 April 2013. ↑ Ziffer, Daniel (3 April 2008). "Fred Schepisi's new local venture". TheAge.com.au. Retrieved 5 June 2014. ↑ "About Fred Schepisi". fredschepisi.com. Retrieved 5 June 2014. ↑ "MTV Confidential" The Daily Telegraph, 23 April 2008. Retrieved 30 April 2009. ↑ Dow, Steve (10 October 2006). "Action Men: Australian directors on film". SteveDow.com. Retrieved 16 September 2011. ↑ Australian Republican Movement (1987–2009). "Records of the Australian Republican Movement, 1987-2009 (manuscript)". description of documents in the National Library of Australia. Retrieved 5 June 2014. ↑ Shaw, Lucas (2 November 2012). "Clive Owen, Juliette Binoche Team With Fred Schepisi for 'Words & Pictures'". thewrap.com. Retrieved 13 January 2013. ↑ "Oz in LA", Cinema Papers, May–June 1979. p. 332.